Stone's new Delicious IPA might get by with such an audacious name if it didn't have Stone's history of outstanding IPAs to live up to. It pours clear, bright, and golden, with an average head. Lots of lemon and citrus candy in the aroma. 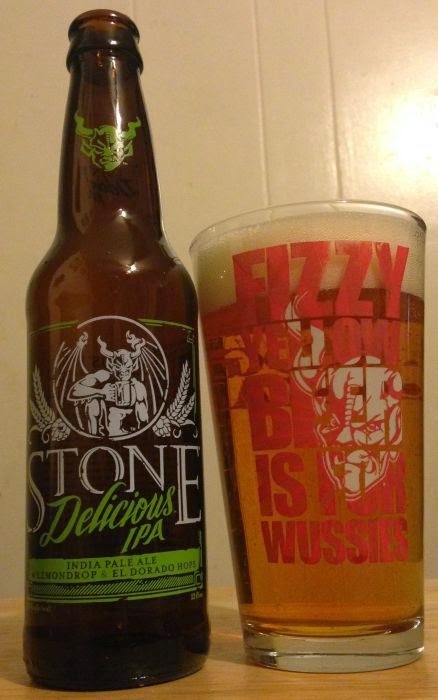 The flavor is juicy up front, like Enjoy By, but very crisp and dry in the finish. Almost acerbic. I wouldn't say it wears out it's welcome by the end of the glass, but it does play all of it's cards in the first few sips. Not as complex or as refreshing as Stone's best IPAs, but a fine beer nonetheless.